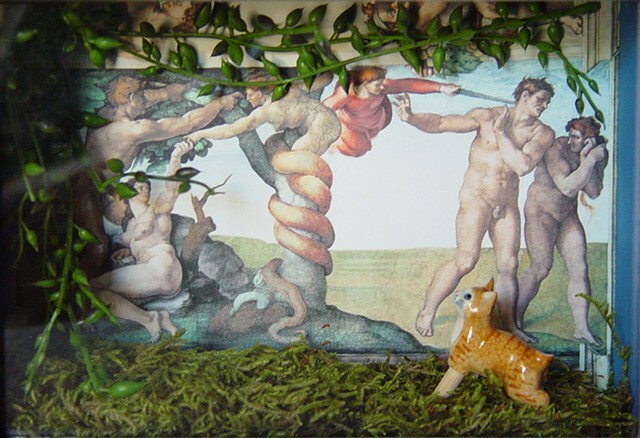 Mixed Media: scanned image of Michelangelo’s “After the Fall,” artificial plant, moss, broken Little Critterz hand-painted porcelain cat, wooden dowel. After Barney Howling at the Moon was damaged when it fell off the wall and crashed to the floor, I repaired it with a new Barney figurine. The damaged Barney, sans tail and missing a front leg, became the centerpiece for After the Fall: Peg Leg Barney as a Manx. I have not yet used the tail and leg.